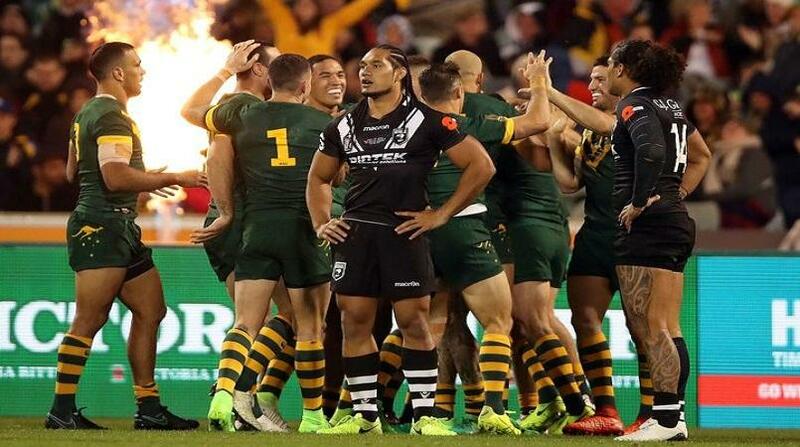 Australia have sounded a pre-World Cup warning to rival nations with a comprehensive 30-12 defeat over New Zealand in the final Anzac Test on Friday night. However the win - on a night skipper Cameron Smith celebrated his 50th Test - was soured by a possible fractured cheekbone to Josh Dugan that could rule him out of State of Origin. The St George Illawarra star came from the GIO Stadium field midway through the second half after clashing heads with Kiwis prop and clubmate Russell Packer and failed to return. His injury was the only low point on a dominant night for the world No.1 nation, who raced to a 30-0 lead before taking their foot off the pedal and allowing the Kiwis two consolation tries. 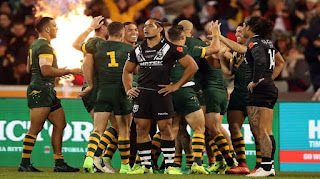 Almost one year after breaking a three-game losing streak against the Kiwis in Newcastle, a crowd of 18,535 watched the home side make it five straight wins against the world No.2. Johnathan Thurston showed no lingering effects of a calf issue by setting up two tries, while second-rowers Boyd Cordner and Matt Gillett also turned in strong defensive efforts. Blake Ferguson continued his Four Nations form with a game-high 214 metres. Up 24-0 at the break, the Kangaroos appeared on their way to a record victory when Jake Trbojevic took a no-look pass from Cooper Cronk soon after resumption. But the Dugan exit coincided with a mini fightback from the visitors, who scored the final two tries through Simon Mannering and Roger Tuivasa-Sheck. On a night they fielded arguably their strongest side in recent memory following the anticipated return of Kieran Foran, the Kiwis disappointed. They have now won just one of their past eight Tests. Dugan opened the scoring in spectacular fashion when he soared to take Thurston's cross-field kick, and Ferguson doubled the advantage with a 90-metre intercept soon after. The visitors twice had opportunities to steal momentum, but Tuivasa-Sheck was held up over the line and Shaun Johnson's bat-on was ruled forward in the same set. The failures opened the floodgates in defence, with Will Chambers scooting through untouched following Sam Thaiday's 30-metre break, and Tyson Frizell completing the four-try halftime lead. Photo: Photosport NZ Martin Taupau looks dejected after yet another Kangaroos try.